This custom wood "condo" invites solitary pollinators to move in and decorate with mud "mortar." From the Hundred Acre Wood to cereal box mascots, the buzz is all about honeybees. But lesser-known pollinators like mason bees are solitary superstars that can pollinate about 100 times more plants than the average honeybee worker. 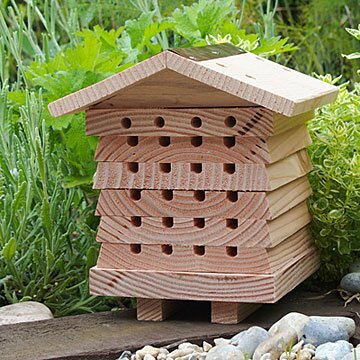 Welcome friendly, industrious pollinators like mason and leafcutter bees with this interactive house. Made from sustainably sourced, FSC-certified wood, its stacked "floors" feature openings inviting individual bees like masons, who furnish their homes with mud "mortar." Simply unscrew the wing nuts at the bottom to separate the floors for cleaning or inspection (in late fall or winter when you won't disturb the residents). This custom condo for beneficial buzzers provides protection and an ideal home to raise baby bees. Hang in a sunny spot facing southeast to catch morning sun. Full instructions included. Designed in the UK by beekeeper and conservationist Norman Sellers. Made in China. Suggested placement/mounting height: ground level to 5 feet. Perfect beehive to attract and shelter wild bees! An awesome addition to my moms garden! Can't wait to get it set up after the snow melts. My husband loved it so much that he wants to order another one. I will put this in the flowers to encourage the bees to pollinate our garden. Easy to set up. Great for the garden. I'm happy to give this as a gift for someone who has everything. So the house is designed so that you can unscrew it and remove the layers and the bees cocooned between the layers so you can clean the house and the bees and hibernate them. The drawback is that the first row of holes at the top are drilled so that you can not open them at all and makes no sense otherwise. Why make it so you can open up the layers but you cant with the 4 holes at the top? Each hole probably has about 8 bees cocooned in them. If you have no interest in removing your mason bees and cleaning them and hibernating them over the winter then this product works fine but I remove mine and clean everything to make sure not to get mites etc in the cocoons and to set them out at an appropriate time in the Spring. Super cute and my Dad is excited to try it out next year. It was a little smaller than I expected but I didn't even check for the deminsions so completely my fault. I would definitely recommend.